So, when I saw that Two Peas and Their Pod had a recipe for chocolate cookies stuffed with peppermint patties, I couldn’t wait to try them! Lucky for me, it’s been a lovely, lazy Sunday afternoon with Matt on the couch watching football and me in the kitchen cooking. I’m already preparing for our Christmas Eve dinner so I don’t have to do everything tomorrow… much less stressful! At tomorrow’s dinner in addition to these yummy, creamy peppermint patty-filled cookies, we’ll be having ham, garlic mashed potatoes, green beans, citrus salad with orange vinaigrette, parker house rolls, strawberry Santas, crock pot mac and cheese, chocolate icebox pie, AND beans and cornbread – Matt’s favorite and a Douglas family favorite. Guess I better get back in the kitchen because my list is pretty long! Enjoy the chocolate York peppermint patty cookies, the holiday season, and spending time with your family! Whisk together flour, baking soda, salt and cocoa. 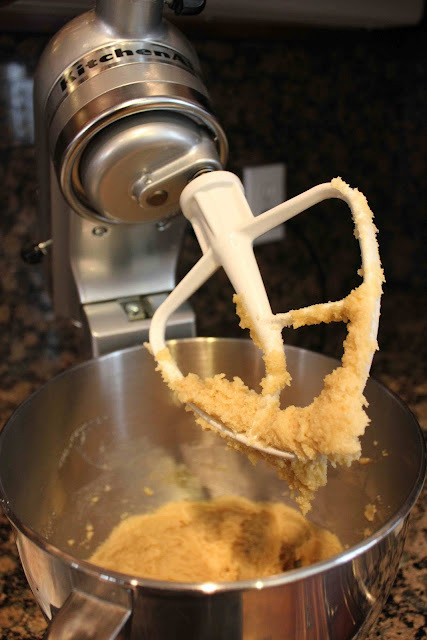 Gradually add flour mixture and beat until flour disappears. Flatten cookie dough and place a peppermint patty in the center. Wrap excess dough around the patty. Bake for 8-10 minutes in a 350 degree F oven. 1. Preheat oven to 350 degrees F. Line baking sheet with parchment paper or Silpat baking mat. Set aside. 3. With a mixer, cream butter and sugars together until smooth. Add in eggs, one at at time. Next, add in vanilla and mix until combined. 4. Gradually add flour mixture and beat until flour disappears. Take a golf ball sized ball of dough, roll into a ball, and flattened it into a disc. Place a peppermint patty in the center and wrap the excess dough up and around the patty (you may want to grease your hands). Make sure the entire patty is covered. Repeat with remaining dough and place on prepared baking sheet, about 2 inches apart. 5. Bake cookies for 8-10 minutes, or until cookies are set, but still soft in the center. Remove from oven and let sit on baking sheet for 3 minutes. Move to a cooking rack and cool completely. Dust the cookies with powdered sugar. One Response to "Chocolate York Peppermint Pattie Cookies"
These are cool…….. With taste and the coolness of mints. Great for soothing the tummy and making your breath be fresh.